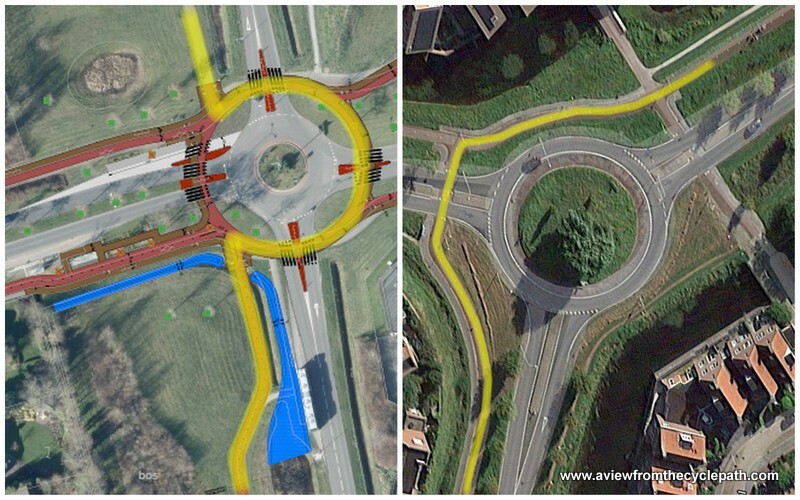 There's been quite a lot of news recently about roundabouts in the Netherlands and I'm pleased to say that the new statistics are highly supportive of my previous article about how a truly safe roundabout should be designed for cyclists. 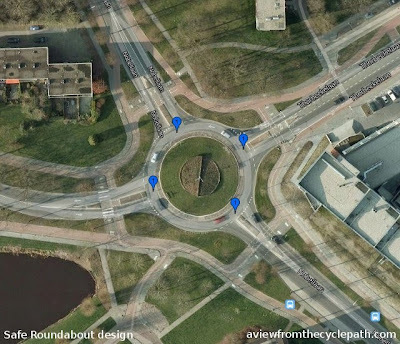 Here in Assen we use this safe design instead of the design used in much of the rest of the country and as a result far fewer cyclists are injured on our roundabouts. Injuries occur elsewhere quite frequently, but the safe design greatly reduces their rate to the point that I don't know of any which have occurred on the particularly safely designed roundabouts in this city. Please go and read my previous article linked above to find out safe roundabout designs. Data from the Smart Traffic Accident Reporting system has been used to create a map which shows the most dangerous roundabouts in the Netherlands. I've picked out below some of the Dutch cities which I've written about before and shown how they rate for roundabout safety. There's a colour code in use. Roundabouts which have caused no problems are not shown, roundabouts with a yellow dot have seen a small number of collisions, orange dots are worse and red dots are the worst locations of all. The colour code doesn't tell whether collisions resulted in injuries. The interesting thing about the map is that it so strongly reinforces the data which I based my previous blog post upon: Only seven of Assen's 21 roundabouts are visible on this map because almost no crashes every occur here on the roundabouts due to the safe design. On those rare occasions when there is a crash it usually results only in minor bodywork damage to cars and that is the case for all the crashes which occurred. Between 2014 and 2017 there were just eight minor crashes with material damage to cars between all 21 roundabouts in Assen. There were no injuries. Annual crash rate: 1 for every 32000 population per year. Injury rate: 0. No-one at all was injured on a roundabout in Assen during this period of time. Groningen is our first example of a city which gives cyclists priority on the roundabouts. Here we will not see the same zero injuries result. Note that on this map we have not only yellow dots but also orange and even red dots indicating sites with far more crashes. Not only were there considerably more crashes, 96 in total, but 26 people were injured severely enough that they had to attend hospital as an in-patient as a result of crashes at Groningen's roundabouts in the same 2014-2017 period. Groningen's population is three times greater than Assen but clearly the roundabouts in that city create far more than three times the danger. Crash rate: 1:7500, Injury rate: 1:28000. i.e. one in twenty-eight thousand of Groningen's population is hospitalized each year by the roundabouts in use in that city. Zwolle's population is 125000 which makes just under twice the size of Assen. This city also uses the dangerous design of roundabout and again you see orange and red dots where many crashes have occurred. 105 crashes resulted in 37 people being hospitalized at the roundabouts in Zwolle between 2014 and 2017. 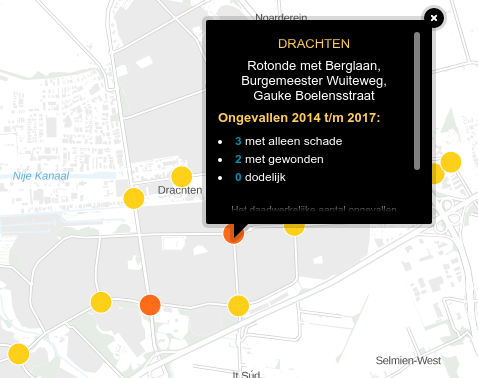 Three years ago I identified one of Zwolle's roundabouts as the most dangerous place in the city for cyclists and it's highlighted on the map above having caused three more injuries. Crash rate: 1:4800, injury rate: 1:13500. One in every 13500 people in Zwolle is hospitalized each year by Zwolle's roundabouts. Please read a more recent update about the danger of the roundabouts in Zwolle. Zwolle went to the effort of rebuilding roundabouts but they chose a different unsafe design to replace the unsafe design they already had. As a result, even the local government of the city has had to admit that three of the top ten most dangerous places in the city for cyclists are roundabouts. The population of 's-Hertogenbosch's 152000, which makes it about two and half times the size of Assen. The city uses the dangerous design of roundabout and they caused 105 crashes with 34 injuries over the 2014-2017 period. 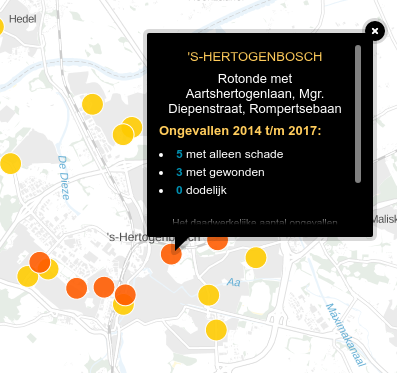 Three years ago I assessed two of the two of Den Bosch's roundabotus as being the most dangerous places for cyclists in the whole city and one of those is highlighted above showing the that it has caused three more injuries. Crash rate: 1:5800, Injury rate: 1:17900. One in every 17900 people is hospitalized each year in Den Bosch each year due to the roundabout designs used. The same pattern is seen even in small cities which use the dangerous roundabout design. Middelburg is a small city in the South West of the Netherlands with a population of just 48000, about 2/3rds the size of Assen. There are relatively few roundabouts but the design used is the dangerous "priority" design. Middelburg's roundabouts have caused a total of nine crashes in which five people have been hospitalized. A crash rate of 1:21000 and a hospitalization rate of 1:38000 per year. More Shared Space roundabouts ? Given the poor track record of Shared Space in general and the poor track record of the Shared Space roundabout in Drachten, you might think people would steer clear of the concept. But that's not happening: A new shared space roundabout was recently built in Winschoten and it's got such a bad record already that it was recently recognized as the most dangerous roundabout in the entire country with just one location having caused 13 crashes and 3 injuries. Winschoten's population is only about 18000 but this roundabout is so bad on its own that we get a crash rate of 1:5500 and an injury rate of 1:24000 per year for the population while ignoring everything else in Winschoten. Winschoten's Shared Space roundabout - recently chosen as the most dangerous in the country. Truly a horrible design. No-one knows what they're supposed to be doing and uncertainty results in accidental risky behaviour. Are we designing for efficiency and safety ? The crash and injury rates quoted for each city above are a primitive way of making a comparison, simply dividing the population by the average annual rates of crashes and injuries without any other factors, but nevertheless, the point as does all the other data, towards Assen's roundabouts being amongst the very safest in the Netherlands. So why isn't the rest of the country copying this safe design ? We shouldn't be surprised by this result. It was predicted 13 years ago. It's been known for many years that the design of roundabouts which gives cyclists priority over motor vehicles around the edge of the roundabout, relying upon drivers always to spot a cyclist who might emerge quickly from a blind spot and assuming that all drivers pay attention to ensure the safety of others as they drive, inevitably results in more injuries. In 2005 the extra injuries resulting from this design were estimated as 52-73 people requiring hospitalization (in-patient treatment) each year. Since 2005, the number of roundabouts in this country has nearly doubled. It is also claimed that more journeys are being made by bicycle than before and there are more cars. Therefore it's reasonable to assume that the number of extra injuries requiring hospital treatment due to the priority roundabout is now around 100-150 per year. That is perhaps why the injuries on roundabouts are now getting more press attention than before. But these extra injuries shouldn't be a surprise to anyone because this was predicted before half of the roundabouts which exist now even existed. If more than a hundred people per year are being injured due to a choice of roundabout design when a much safer design which is proven and already in wide use could be adopted, there needs to be some other justification for the unsafe design. Typically, people claim that it's more efficient for cyclists to have priority, but unfortunately the "priority" is merely part of the name of the design and not any proven effect. In reality you can't ride around a priority roundabout as quickly as you can ride over the safe design because you have to be quite cautious when you're relying on others always to look out for you. In fact, many "priority" roundabouts are quite unpleasant and inefficient for cyclists because we are forced to cross more lanes, which means slowing considerably and repeatedly checking whether drivers approaching in both directions who are supposed to have noticed us actually will give way to us, and the much tighter corners on the priority design often cause trouble. Are we just adopting the "priority" design because that word sounds good ? Not all of the poor features of this roundabout and surrounding infrastructure are included in the video. This gentleman clearly had ridden on the "wrong" side of the road, treating a narrow unidirectional cycle-path as bidirectional. People do that if the infrastructure makes doing the wrong thing more convenient than doing the right thing. Once you reach a priority roundabout when travelling in the wrong direction, all bets are off for safety. If I had made a return trip through the roundabout in the video I would have ridden here. This skips the indirection to the other side of the road, but instead riders have to cross three lanes of traffic, the first of which is a bus lane, and pass over two islands, neither of which is wide enough to offer safety even to a child's bike. I suspect that in reality few people go all the way around in the video so there will be many people riding in the wrong direction here. That is far more dangerous because they'll be relying upon drivers looking in both directions at once across three lanes for their safety and they haven't got any refuge to hide in. Stills from the video above. How can anyone in any seriousness claim that the "priority" roundabout on the left, which requires cyclists travelling South to North to turn sharply and cross six lanes of traffic to go all the way around the roundabout, is safer or more convenient than the one on the right where cyclists cross two lanes of traffic in a straight line with good sight-lines ? The safe design is well established and has a proven track record. It also is naturally resistant to error in implementation due to imperfect copying of the design, making an ideal basis for other countries to create their own safe roundabout designs for cyclists. The "priority" design is proven to cause a significant level of injury to cyclists in the Netherlands and even here is misinterpreted quite often in such a way that it is more dangerous than it need be and causes significant inconvenience to cyclists, as shown in the video above. The roundabout design which should be copied by countries outside the Netherlands is therefore the safe roundabout design. Copy what is proven to work, not merely anything that is "Dutch". On our study tours we demonstrate the difference that good infrastructure makes. Roundabout designs are included. A new study from Denmark provides more supportive evidence. In particular (from the Abstract): "Single-lane roundabouts with separate cycle paths, where cyclists must yield to motorists entering or exiting the roundabout, are safer than roundabouts with cycle lanes." It doesn't matter which country they are inplemented in: the principles of safe roundabout design remain the same. At last winter seems to be over. The sun really came out this week and the temperature crept up to nearly 30 C. Touring through the countryside became so irresistible that I took two half days off and went out on Friday evening as well. Through the forest with Steve on Wednesday afternoon's 90 km ride to the South of Assen. A fellow recumbent rider on Wednesday. A very old mushroom style directional signpost for cyclists. These provide a few more useful service to cyclists who are trying to actually go somewhere than the much hyped knooppuntennetwerk. One of the many hunebedden (dolmans) in Drenthe. Not all of our route was spent on cycle-paths through forest and heath. We also used some very small rural roads without motor traffic and cycle-paths like this which provide direct routes alongside major roads all across the province. This bench is a cycling facility. It was installed to give people a view of the lake. Everyone cycles in the Netherlands, including racing cyclists who use the same cycle-paths as everyone else. Why wouldn't you when these offer shorter distances to destinations, excellent surface quality and a very pleasant experience away from motor traffic ? Art at a farm. It marks an area where land use was reformed. "What happens to people if the law is applied arbitrarily"
We're back in Assen, a city which sets many good examples for cycling infrastructure. The width of cycle-paths like this one, connecting a suburb to the city, make cycling safe, attractive and convenient for all. Excellent quality concrete cycle-paths like this reach out in all directions from the city. Recreational paths (on routes which don't get used much for commuting or school traffic) can be narrower. This one just fits between the trees. A lake in North Drenthe. Let's not forget which country we're in. I'm happy to say that I'll be a Dutch citizen very soon now. Recreational path selfie. Very smooth concrete. You might have heard that there are a lot of windmills in the Netherlands. Even by Dutch standards, this is a particularly nice example. Super smooth wide recreational path shared with very occasional agricultural vehicles (we didn't see any). This path is made unattractive to normal through motor traffic because there is a good surface only for cyclists. Tractors can of course be driven through the mud. This design removes motor traffic, unravelling routes in the countryside so that rural cycling is made more attractive and pleasant. Just before the two paths merge again, into very wide smooth concrete. Entering Groningen. The space under bridges in the Netherlands is usually allocated quite equitably for cyclists. Fresh potatoes fried in 100% vegetable oil (vegan). Excellent. Note that to the Dutch, fried potato chips (friets) are known to come from Belgium. People from other countries often think they originate elsewhere. On the way back home, passing a school. As always, almost all students cycle to the school. Friday evening's after work ride was just 20 km in length and there are just two photos. This shows a "hazard" on a recreational cycle-path next to the golf course in Assen - a golf cart. It's perfectly entitled to be here. Presumably a condition of the cycle-path being constructed through the golf course site. To close, what could be more Dutch than tulips, bicycle and bicycle-path in the same photo ? Of course I didn't start cycling on Wednesday or stop cycling on Friday night. Cycling is an everyday activity for us. Earlier in the week, and also on Wednesday, Thursday and Friday, I took parcels to the post office for our business. On Saturday I used my bike to go to the market for vegetables and today Judy and I went on a recreational ride this morning before gardening in the afternoon. Drenthe was deservedly made the world's first UCI bike region a few years ago. We made our lives here because having looked around extensively this is the best place we found in the world for cycling.